The American Academy of Forensic Sciences Humanitarian and Human Rights Resource Center (AAFS HHRRC) offers the Clyde Snow Award to a forensic scientist or organization that has made outstanding contributions to humanitarian action and the global advancement of human rights through the use of forensic science. 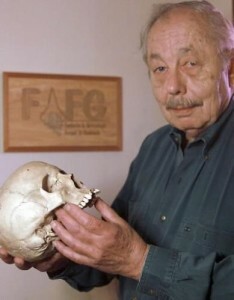 The award recognizes the pioneering contributions of forensic anthropologist Clyde Collins Snow (1928-2014) in the application of forensic science to human rights. Dr. Snow helped catalyze the development of forensic science to support human rights throughout Latin America and around the world. His career accomplishments present an extraordinary model for forensic scientists to reflect upon. Many accomplished individuals and organizations were nominated this year for the Clyde Snow Award. All candidates were reviewed and ranked by the HHRRC International Advisory Council and Subcommittee Chairs. This year, the Clyde Snow Award goes to the Argentine Forensic Anthropology Team (Equipo Argentino de Antropología Forense, EAAF). The EAAF represents a non-government, independent organization. Clyde Snow was instrumental in its formation in 1984. Since then, they have not only worked in Argentina but have also conducted forensic missions in many countries around the world. Recipients of the Clyde Snow Award embody the spirit and far-reaching contributions made by Dr. Snow. The Award is also intended to stimulate the career development and minds of young forensic scientists. In addition, the Clyde Snow Award exemplifies the commitment of the American Academy of Forensic Sciences to the application of forensic science to help resolve important issues in the international and global domain. Candidates for this award (individuals or organizations) are nominated by a member of the international forensic science community. Selection criteria focus on the sustained body of work in humanitarian forensic science. The Clyde Snow Award is not for any specific contribution in the forensic sciences, but is intended to recognize a sustained effort in the global application of forensic science to human rights investigations and/or humanitarian action. The Clyde Snow Award will be presented to the EAAF during the 2018 AAFS Annual Business Meeting in February in Seattle.